Foxley towermill lay to the southwest of the village and was a five storey mill built of red brick by William Elvin in 1845, with a datestone being placed above the door. Four patent sails were used to power 2 pairs of French burr stones and a flour mill although the mill was advertised as being capable of driving a third pair of stones if they were installed. A date tablet of 1859 was incorporated on the mill house. As William Elvin still lived at Bawdeswell Mill House, he was recorded in directories as being at Bawdeswell until 1858. He was said to have made his way to Foxley Mill each day across the intervening fields. 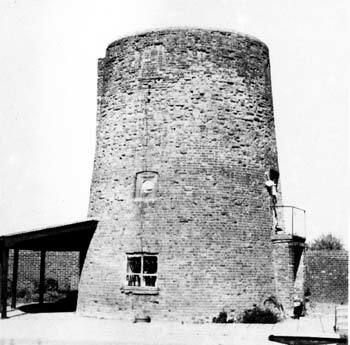 Also a Capital brick TOWER WINDMILL with five floors, patent sails, with revolving cap to wind herself, drives two pairs of stones (French burrs) with hoist tackle, flour mill & machinery complete in good working order. The Mill has power & is capable of driving a third pair of stones if put in. The Property is freehold & situate in Foxley adjoining the public road leading from Billingford to Bawdeswell & is now in the occupation of Mr. James David Elvin & of which immediate possession may be had. Apply to Messrs. Mitchell& Clarke, Solrs. or to the Auctioneer, Wymondham. As advertised in November 1861 except possession 11 October next. A good New Brick & Slated Dwelling house & capital Brick TOWER WINDMILL with five floors, patent sails, two pairs of French burr stones, & machinery complete: with about 4 acres of excellent Land situate at Foxley in Norfolk, now in the possession of Mr. J. E. Elvin. Immediate possession may be had. To be SOLD or LET, a good new Brick & Slated DWELLING HOUSE & Brick Tower WIND-MILL with Five Floors, Patent Sails, two pairs French Burr Stones, with about 4 Acres of excellent LAND at Foxley in Norfolk, now in the occupation of Mr. J. D. Elvin. For particulars apply to Messrs. Mitchell & Clarke, Solicitors, Wymondham. All that TOWER WINDMILL called the “Foxley Mill” with four patent sails, driving 2 pairs of stones, also Dressing Mill with all requisite machinery for driving the same. Together with a substantial Dwelling House (nearly new), Stable & Cart Shed & 3 acres of excellent Arable Land, all situate at Foxley, Norfolk. Apply to Mr. E.G. Read, Mattishall, who will show the Premises or to Messrs. Kerrison & Preston, Solrs. Norwich. WANTED, a Young Man who can work a Windmill. Apply to W. Neal, Foxley Mill. Messrs. Ireland are instructed to offer the above very eligible Property for Sale by Auction early in October. Possession may be had on the 11 th October next. Further particulars in next week’s papers & to be obtained from Mr. Arthur Preston, Solr. Bank Street, Norwich & of the Auctioneers, 5 Bank Plain, Norwich & Guestwick, East Dereham. Messrs. Ireland are instructed to offer the above eligible PROPERTY for Sale by Auction at the “Ship” Inn, Foulsham, on Tuesday 5 October 1880 at 6 for 7 o’c. The MILL is conveniently situated, well appointed & capable of driving two Pairs of Stones, with Flour Dresser. The RESIDENCE is a very comfortable one with all requisite Offices & the FARM BUILDINGS comprise excellent Stabling, Granary & Cart Lodge. The LAND, Arable & Pasture, is in a high state of cultivation. All the above are now occupied by Mr. James Buckenham, by whom possession will be given on the 11 th October. Particulars of the Auctioneers, Norwich & Guestwick, East Dereham or of Mr. Arthur Preston, Solr. Bank Street, Norwich. A Brick TOWER WINDMILL, CONVENIENTLY situated, very powerful & well appointed, capable of driving two pairs of stones, with Flour Dresser; also a comfortable DWELLING HOUSE with all requisite offices. FARM BUILDINGS comprising excellent Brick & Slate Stable, Granary & Cart Lodge, also 3a.2r.35p. of Arable & Pasture LAND. In a high state of cultivation, abutting upon the estates of the Earl of Leicester, the Rev. E. Lombe & the road leading from Foxley Village to Billingford. All the above are now occupied by Mr. James Buckenham, by whom possession will be given on the 11 th October next. Apply to Messrs. Preston & Son, Solrs. Bank Street, Norwich. A substantially Brick Built & Slated DWELLING HOUSE with Garden, Orchard, Brick & Slated Stable, Cart Lodge & Granary, the Brick Tower & Machinery of WINDMILL & an Enclosure of superior Arable & Pasture LAND, now in the occupation of Mr. George Juby. Particulars of Messrs. Preston & Son, Solrs. Norwich & of the Auctioneers, Framlingham, Suffolk or at the place of Sale. By 1980 the mill had been reduced to 3 storeys with a flat roof and was bordered by a wall, a swimming pool and modern bungalows. The remaining tower was 30ft high and 20ft 6ins diameter at the base. Prior to renovation in that year, the tower had been used as a store. Bought property from Mr. Hepburn Wright in September 1980. Have renovated ground and first floors of mill, without structural alterations, to comprise an Art Gallery. Hepburn Wright purchased property from Parfitt Brs. In 1975, demolished old Mill House and built a modern single storey dwelling round three sides of a courtyard opening east to mill. Mill has name A. E. Parfitt cut into door of ground floor which leads to adjoining outhouse. Also has an old fireplace to the north with an outside chimney. Father, Arthur Ernest Parfitt purchased property in 1890. Mill had been dismantled. (Kelly’s 1900 – market gardener) Later with sons in partnership developed premises for fruit farming. 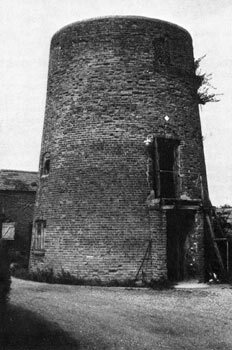 Bawdeswell smock mill was on the Evans Lombe Estate and when it became uneconomical or disused its demolition was ordered. 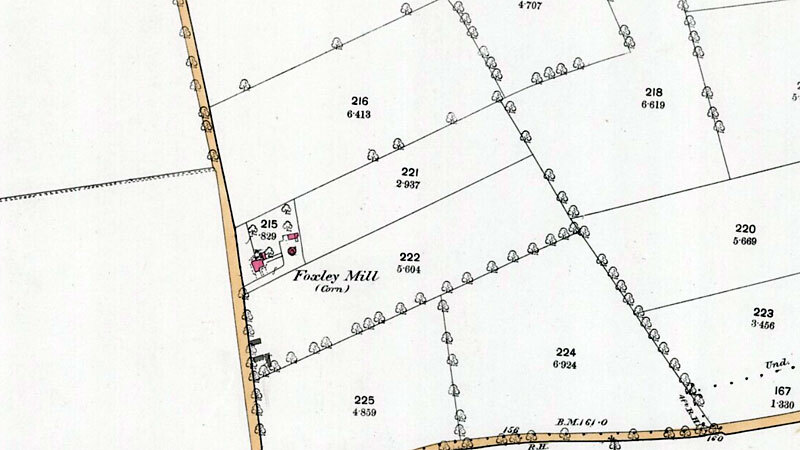 It appears that last miller there, William Elvin then built Foxley Mill (1845) but still lived at Bawdeswell Mill House, which still remains, thus being given as miller at Bawdeswell till 1858. However, he made his way to Foxley mill every day across the intervening fields. 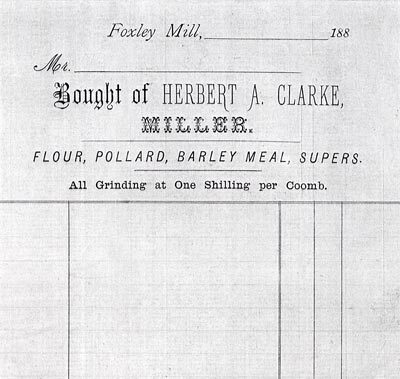 Foxley Mill House was built in 1859 and James David Elvin is given there in 1861. I believe George Juby who you have as the last Miller, was my great great Grandfather. The Juby Family were living in Bawdeswell around this time and he is the only George Juby on the census that was living nearby. His Parents were John Juby and Martha Adcock and he was married to Ann Elsden. Most of their 10 Children were born in Bawdeswell. On the Whissonsett 1881 census George was listed as a thrashing Machine Owner living in Hurn Lane but I'm not sure if this would be a step up or down. The 1891 the census shows he had moved to Horsham St. Faith. Unfortunately he was killed a on 28th August 1895 aged 49 by a wagon wheel in a carting accident.